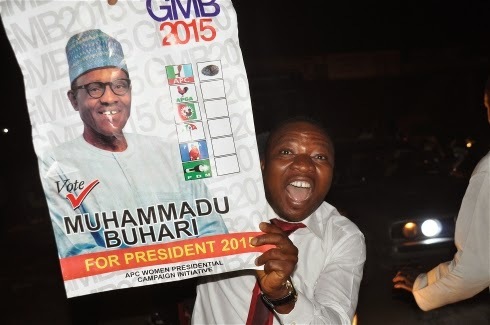 KADUNA, 31 March 2015 (IRIN) - Nigeria's presidential election has been won by Muhammadu Buhari, a former military ruler who becomes the first opposition leader ever to unseat an incumbent. There have been some allegations of fraud, but the fact that Goodluck Jonathan accepted defeat and called his political rival to offer congratulations is being widely applauded as the final act of an extraordinary election. Ibadan Street is in the heart of the old commercial district of the northern city of Kaduna, but on Tuesday shops were shuttered and children were playing football on the quiet, empty road. Nigerians spent the day close to home waiting anxiously for the results of one of the most closely fought elections in recent memory. “We need change! The people ruling us, they don’t consider the masses. They consider only the big ones, the people on top,” said Mustapher Baker, who had gone over to his brother’s house to borrow some rice. He works at the city’s water board but, like other public servants in Kaduna, had not been paid his salary for the past three months by the People’s Democratic Party (PDP) - the party of Goodluck Jonathan - which controls the state government. “Change” was the slogan of Buhari and his All People’s Congress (APC). The party’s symbol is a broom – a sign they say of their intent to sweep Nigeria free of corruption and its bad old ways. “This government has failed. We need change, we need jobs, we need schools, we need hospitals that work, we need better security,” said a man next to a mannequin of a broom-wielding Buhari outside a shop in Ibadan Street. Kaduna voted massively for Buhari, a no-nonsense former military leader, and against President Jonathan. Buhari, is a folk hero in the north, and with a home in Kaduna was always expected to win here. But the margin of victory – 1.1 million votes to 484,000 - was unexpectedly large. In the last election in 2011, he scored 1.3 million to Jonathan’s 1.1 million and was on the losing side of the overall election – an outcome that triggered terrible violence. The shadow of that poll still hangs over Kaduna. The rioting pitted northern Hausa-Fulani, the same ethnic group as Buhari, against southern Christians associated with Jonathan, and killed more than 800 people. Since 2000 there have been three eruptions of communal violence in Kaduna that have left thousands dead. There is a “balance of terror” said barrister Sam Alung, with both communities prepared to kill mercilessly. The consequences of those pogroms is a city that has gradually become divided to the point where the Kaduna River is now the line of demarcation between largely Muslim Hausa-Fulani living to the north and Christians to the south. “The only points of contact are the markets and the administrative offices. In the morning people come to the market or the office and mingle, in the evening they head to their separate homes in their separate communities in the north or south,” said Festus Okoye, national coordinator of the Independent Election Monitoring Group. “People are really security conscious. It’s not a deliberate policy or organized thing, but individuals just feel safer among their own, given that history,” said Alung. Kaduna once prided itself on its cosmopolitan character. For generations people from across Nigeria have been drawn to the city as a railway hub, a manufacturing base, the administrative headquarters of the old Northern Region and because of its long and continuing association with the military. “What radicalized people was when neighbours killed their neighbours,” said Okoye. In 2000 violence erupted over the introduction of Islamic law in which 3,000 died. “Before we had crises in different parts of Kaduna, but the Sharia crisis heightened this sense of identity – the alienation and separate identity became sharp.” The election violence in 2011 confirmed the seeming inability of communities to manage political disputes and their degeneration into religious and ethnic conflict. Kaduna’s divisions are not set in stone. There are shared spaces around the central business district and the administrative offices in the north, but the economic balance of the city is now shifting south, reducing those limited points of contact, and strengthening an enclave mentality among both communities. The south has been the historical home of the city’s industries, but what is now emerging are new shopping precincts and booming suburbs of a growing middle-class. With the exception of a visit to a ministerial office, residents need not cross the river at all. The division is no longer just religious but also based on class. Abolaji Aziz is a Muslim from western Nigeria, but he has moved south of the river to a bustling Barnawa, where his rent is double the amount he was paying for an apartment in the northern suburb of Tudun Wada. But he feels safer and is willing to pay more for that security. Aziz left because of what he feels is a growing resentment. Should trouble erupt, even though he is a fellow Muslim, he believes he would be viewed as an outsider – part of the despised “elite” - and “I can also be killed, or my car damaged”. It’s “a question of education”, he said. There is a false security in the geographical division of the city. “Lack of social interaction retards development, prevents a cross-fertilization of ideas,” said Alung. He wants the state government to introduce mixed projects involving developers from north and south Kaduna to break down the barriers. A sandbagged military checkpoint separates the inhabitants of Tudan Wada from the rest of Kaduna. Unemployment here is high, with school completion rates low. IRIN met Fatima Ibrahim* - a graduate student - on Monday as she was stocking up on supplies. “The demarcation has happened, but it’s not good. We can and should come together, but at the end of the day it’s about education. The problem is religious scholars who don’t preach peace but preach chaos,” she said.